Skyscript.co.uk :: View topic - Will Venus save her life? Will Venus save her life? Posted: Tue May 22, 2018 4:30 am Post subject: Will Venus save her life? Our mother (my mother in law) is 91 and currently in a nursing home. One afternoon last October, she and her daughter went out to meet their friend at some tea shop and on the way, mother tripped and fell on the street. We were horrified to hear of her accident because she just came back from heart surgery a week before! At the time of accident she said she felt OK and refused to go to see a doctor. By 8 pm we received a call from her daughter saying they were in the ER (an emergency room), and all doctors said mother was dying and there was only a 25% chance of survival even with surgery. She has four children plus two daughters in law -- to our and doctors’ surprise, she survived without surgery. I will skip the details but she eventually had cranial surgery a month later. At the time, I asked horary “will she live?” -- The chart showed her significator was conjunct Jupiter in 11th and there was a nice mutual reception between her significator and lord 8th in turned chart. I found out from her natal chart that her Part of Fortune is besieged by the Sun and Mercury in Libra in 9th. Sun rules the cusp of her 8th and Mercury rules the cusp of her 6th. Since then she went from ER to ICU (intensive Care Unit) to Skilled Nursing Home and now to a 24 hour Assisted Nursing Home. Over all, ambulances took her five times to emergency rooms. She had two strokes, she lost the ability to walk, yet she managed to fall several times because she tried to get up from her wheelchair. (She does that when nursing home assistants are not around, she’s fearlessly independent, but sadly also her brain is half gone). One of my brothers in law is taking care and visit her several times a week. At mother’s request, my brother in law hired a yoga teacher and a physical therapist. They come once a week but according to my brother in law, it won’t make a difference. She is getting a lot weaker since she left the Skilled Nursing Home in the end of January. I noticed transiting Saturn Rx is going to make exact square to her natal Sun on July 11th. Her prog. 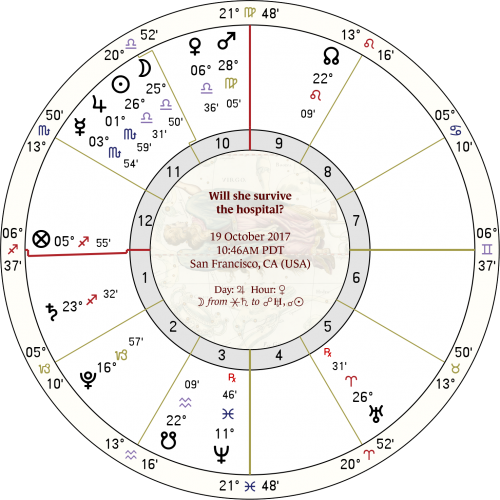 Venus in 16 Capricorn 17’ and her pre-natal Solar Eclipse @ 16 Cancer 57’ make partile opposition. Earlier in May, she ended up in the ER again due to a fall from her wheelchair and this incident made me ask horary will she die this month? Well, there are 11 more days left to the end of May . . . but it’s possible that Venus conjunct her ascendant will save her life again? All of us are concerned about how long she will live. Her significator Mercury, termed by Venus is peregrine and in radix 8th house (but she is still alive). Mercury is separating from Mars, lord of radix 8th but Mercury is applying to Saturn Rx, lord of derived 8th with mutual application. I read somewhere that if one of the significators is a retrograding planet, application is not favorable (let along it is the malefic planet). The sun, giver of the life, is conjunct Algol and applying Mars (the lord of illness, turned 6th). Mars is detriment in Taurus and its ruler Venus who is dispositor of the Sun (mother is a Libra born). However Venus is conjunct mother’s ascendant. Below, I’m posting the Chart I mentioned earlier, at the time our mother was in the Intensive Care Unit. As I said, we all (including doctors) were surprised at her luck. She survived by mutual reception. Also Jupiter, the lord of turned 4th conjunct her significator Mercury and Part of Fortune conjunct her turned 4th (end of the life). The Moon (lord of radix 8th) is combust the Sun and just separated conjunction with Spica as well as separating sextile from Saturn. Posted: Tue May 22, 2018 9:35 am Post subject: Re: Will Venus save her life? I hope you don't mind me re-posting the chart. I have a hard time visually with the charts from Astro.com as they're so big; they require scrolling to see the chart in its entirety on my screen. interestingly, my software has some of the cusps and positions about a minute out. Paul (Skyscript mod) told me this happens across the different astrological software platforms, but first time noticing it. I'm so sorry to read of your situation, Fortuna. (hope you don't mind if I call you that.) these situations are never easy, but I was struck by the compassion in your post and all the steps your family has taken to get Mother back in better health. I think you're right to be hopeful about that Venus, although I may want to come back to it at the end of this post to reframe how we might interpret Venus's role on Mother's derived ascendant. we'll use the 10th house to signify the mother, and so give her Gemini and Mercury as significators. I enjoyed reading that she's 'fearlessly independent' -- I don't imagine you can tell someone signified through Gemini that their mobility is impaired and they need to act like it. much less so when you consider that Mercury is in stubborn Taurus, conjunct Uranus, applying to a trine with Saturn and in a separating square to Mars. I'd quite like to know this woman myself! so here's what I see. the Moon is in the 9th house, which is Mother's turned 12th. that, for me, places an emphasis on necessary hospital care. you might be able to separate the idea of 'hospital' into two houses, the 11th and 12th. the 11th house is the recuperative, mending type of hospital stay. (in terms of justification for this line of reasoning, Lilly once judged that a ship which had been damaged by storms was in a southeastern port being mended, because he found the significator of the ship in the 11th.) the cadency of the 12th suggests the life force is diminished/diminishing, and so shifts the emphasis away from 'mending' to 'doing what we must to stay alive'. hospice care, ICU, skilled nursing homes -- these are all 12th house places as we really don't have much choice: we either stay, or we face the (possibly dire) consequences. so this Moon in the 12th house is perhaps clueing us in to Mother's health being very much connected to the quality of care she's receiving at this stage. Mercury's been a very busy planet lately. most recent aspect was a conjunction to Uranus, then a square to Mars. now, that square to Mars perfected at 28º Aries/Capricorn, and was a received square (in other words, Mercury applied to Mars from Aries and was received). I think this reception protected her a great deal, because that is a nasty square when Mercury is peregrine, in the terms of a malefic (Saturn) and then rushing to a conjunction with Uranus at 29º Aries. Mercury's now at 5º Taurus, which means the square to Mars perfected 7º ago. as this is a separating aspect, it would signify an event in the recent past which has not faded in its effects (Mercury is still in Mars' orb, and vice versa). I would equate this to 7 months' time, i.e., the fall back in October. that this horary is showing a past event through a Mercury/Mars square (perfect symbolism for falls or crashes) with reception indicates a great deal of protection over her at that time. Uranus of course does not receive planets, which I think can help explain why this has still lingered -- something more permanent has taken place here, in spite of Mars' reception. as a quick aside (which I think comes into relevancy further on in the post), I'm struck by the connections to the original horary you've shown us. remember that Mercury and Mars perfected their square at 28º Aries/Capricorn. in the horary, "Will she survive the hospital? ", Mars at 28º Virgo sits in trine to where he perfected a square to Mercury just prior to the horary, "Will she die before the end of May? ", a very sharp connection. the Sun and Moon and Uranus are also plugged into that square from the end degrees of cardinal signs (Moon at 25º Libra and Sun at 26º Libra opposing Uranus at 26º Aries). the Sun and Moon in the first horary are in trine to the new horary's midheaven (Mother's derived ascendant). Mercury (mother's significator in both) occupies opposing degrees in these charts.. a few other more minor links between the two horaries but will just leave it there for now. stunning repetitions here that I think can teach us a lot about how timing does and doesn't work in horary (and how, totally unbeknownst to you, your mind formed this micro/macrocosmic connection at two moments months apart, yet so celestially linked). back to the main horary and the question of whether or not she has the strength (and luck of circumstance) to push through this. the 10th-ruler, which signifies the Mother, is in the radical 8th house. Mercury's separating from Mars, ruler of the radical 8th, and applying now to Saturn, ruler of the turned 8th. this Mercury is aspectually besieged between two malefic planets, imparting an 'out of the frying pan and into the fire' feel. the difference is, when Mercury had aspected Mars, Mars received Mercury and so Mercury was shielded from the worst of what Mars could have done. that isn't the case with Saturn here -- the mutually applying trine to Saturn comes without reception, and so we cannot have the same hopes of escape as we could under the Mars aspect. Mercury's application to Saturn is not ideally anyway, never mind his rulership of the turned 8th, because Saturn is the natural significator of death, is placed in the 4th house (which has associations with the grave), and is retrograde (i.e., we're revisiting something unpleasant here, or never really got to be free of it in the first place). not immediately called into focus here but noticing that Mars, the turned 6th-ruler, is in the turned 8th house; Jupiter, radical 6th-ruler, is in the turned 6th, retrograde (again, images of 'returning'/'recurring'). this situation appears very entrenched. I struggle to think that she would pass before the end of May. the chart has shown that each degree signifies a month (see above re: timing the Mercury/Mars square and the accident last October, 7 months ago), and the aspect which troubles me is Mercury to Saturn. this completes in 3º, but as Saturn is retrograding back, things may well be hastened a bit (because Mercury doesn't have to travel the full 3º, as Saturn is doing some of the moving too). perhaps this leads us to 3 weeks, or keeps the units in months but pushes us just shy of 3 months (e.g., 2 and a half months, etc.). I'm looking 3 weeks ahead in the ephemeris now and thinking that June 15/16 look troublesome. Mercury perfects an opposition to Saturn on the 15th (using PDT), and at the same time, the Sun will be on the 2nd horary's midheaven and opposite the first horary's Saturn, and the Moon will be at late Cancer, completing the cardinal grand cross pattern from the first and second horary (i.e., Sun/Moon at 26º Libra opposite Uranus at 26º Aries in the first chart, and the Mercury/Mars square which perfected at 28º cardinal just before the second). the Cancer connection is interesting to me because that's the one leg of this grand cross that had remained unoccupied. also has just occurred to me that, if I've understood your post correctly, she has her natal Sun at or near 4º Cancer, and the Mercury/Saturn opposition on June 16th will fall right on her natal Sun. I'm not seeing anything significant 3 months ahead, at least not something which reunites the horary significators. that said, if we go to the start of July, July 4th, Mercury perfects its opposition to Mars and the Moon will then be on the descendant of the horary (late Pisces). the Sun and Saturn are in separating opposition, but there is a grand trine in water signs with Sun/Moon/Jupiter (bringing together 6th house significations in the second horary due to Jupiter's position and rulership in that chart). but as I said, I think you were right to see that Venus as a positive. Venus rules her turned 5th house, and I think speaks to the great help and blessing you and your brothers in law have been to her as she manoeuvres through this. Venus on an angle takes away some of the pain and softens where she can. you all have been and continue to be an encouragement to her. but as Venus also rules the turned 12th for the mother, thinking it might also suggest the need for good care. at any rate, should go ahead and post this and get back to my work, but did want to slow down and spend some time on this chart this morning because it did feel so special and powerful. would be interested to hear your thoughts, and of course the thoughts of anyone else reading this post/visualising the outcome from the charts. If she is a mother-in-law, then she is your husband's mother, so wouldn't she be Jupiter? I’m following the querent’s methodology, because the real power in a chart are the associations we make to it when it has our full focus. right, wrong or indifferent, she connected the mother-in-law as ‘mother’ and assigned her to the 10th, and I feel that that’s probably the best way into sharing perspective on this chart. but come to think of it, I think I would’ve done this too, if I can say. I don’t like turning on ends, try to keep it to one derivation only. kind of like asking about the health of ‘my brother’s cat’ — no sense in going 6 from 3, just go to 6 as there’s only one cat under discussion. if she’s asked about two mothers, hers and her husband’s — then totally with you, more turns needed. The reason I use my mother in law for radix 10 and not 10th from 7th is although I asked the question, my partner and I are together in her affair -- as you can see both charts I posted have double signs at ascendants (my own mother die quite young therefore at the moment, she is the only mother I’ve got). In the past, I’ve done many charts regarding her health (as she is quite accident prone) and I came to trust 10th rather than 4th. . . the various planets fall in much better and made sense. By the way, I was looking at one of the books of rulerships and according to this, in a woman’s chart, mother in law is 10th. Wade, thank you so much for your time and your detailed analysis of two charts. I printed out your replies so I could study with the charts (it might take a while for me to respond). In the meantime I ‘m going to post mother’s chart. My observation of her is: this woman has a very sharp mind, quite well-read, worldly and has good reasoning power – she’s good at “cause and effect” type of problems. She’s feisty and love to argue with people but has a good sense of humor (often, very sarcastic). She can be nasty to her own daughter but she treats her two daughters in law with reserve. In short she is a good mother in law, in spite of her opinionated personality, she never meddled into my affair and respected my choice of never wanting to have children and other “wife should be doing this or that stuff”. Date of Birth: Tuesday, 28 September 1926 at 200p.m. First of all, my sincere gratitude to you for your time volunteering and assisting to read my two charts, let along those extra charts you re-posted from your own computer! I am stunned by your technique of combining the horary charts in order to discover the planetary connections and bring out those hidden meanings of the symbolisms. Your explanation of 11th house as the recuperative, mending place makes sense, therefore it is the house of hopes and wishes. As of today, mother is still sharing her life with me and the rest of the family, however, I’m ever more coming to the realization that her end is near. During the course of your letter, you pointed out the unoccupied area in the charts -- I experienced a strong impact at the time when you said “The Cancer connection is interesting to me because that’s the one leg on this grand cross that had remained unoccupied” . . . it was her Cancer Moon which filled the spot and in this regard, I suddenly felt her life relates with my own mother’s death. My “own” mother had six planets in Cancer. Since your letter, I have been checking and comparing her various health charts, etc. and discovering something new. To my surprise, I have learned a lot in a few days -- regarding June 15/16, T. Saturn is conjunct with her natal ascendant, squaring the Sun and opposing the Moon . . . you have made me see the unoccupied area which is now completed by her natal Moon (and my Uranus) -- those are telling me it is time for my "second" mother's departure from my life. "Saturn is in 7th house. Mercury Rx and the Moon (querent also all her children) are approaching Mars (lord of 2nd) and Saturn who is her significator." Interesting. . . I was just reviewing the chart and spotted my mistake. Funny that first thing I mentioned was "Saturn is in 7th house". Retrograde Mercury will not approach Saturn as Moon does. ( . . . and probably that was what I saw back then -- that she will not come back to her place). However, that detail escaped from my memory and I only remembered that I was confused at the time. Upon posting this chart for Wade, I did a quick reading and missed the small print of "r" next to Mercury. I reduced the size hoping it's not too big for Wade's computer, but as for my computer the image could use a magnifying glass (and I didn't use it, darn!) -- however, Mercury went direct next day. April 14 was the date of this chart. There's 2 degrees between Moon and Saturn and if I'm correct, it corresponds to two months from the date which is June 15/16. To me it's rather eerie. Mercury Rx in here completes Cardinal grand cross from other charts and also it fits into Saturn transit in her natal chart as well. Again, thank you very much, Wade, and I will update this if anything happens to her condo. We are now in July and our mother is still alive. She is to everybody's surprise getting stronger. Currently, my brother in law's mood seems upgraded as well. Although I am aware that malefic T. Saturn Rx is conjunct her natal ascendant and still casting square to her natal Sun, I'm wondering if Venus conjunct her ascendant in the horary chart might be saving her from death. Anyway, as I mentioned before, she had a heart operation at 91 and a week later was already walking around the city sidewalks by herself (rejecting her daughter's arm!). She always likes to do things her own way and it seems she decided that she doesn't want to die, not just yet (she's only 91, after all). I didn't read through the comments but I see her as Jupiter and don't see Mercury as a good significator for an elderly person nor does it make sense given her relationship to you. Her dispositor is Mars, the radical 8th ruler, which had just changed from exaltation to peregrine status and is applying to Mercury in the 8th in 5 degrees via square and without reception (which then translates the light to Saturn in her house), which could show death occurs in 5 months (or years) from the question. The influence of Uranus seems like death would be sudden and unexpected. 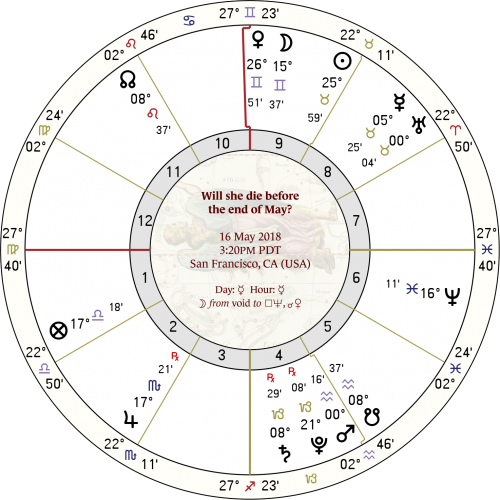 I agree that the Moon applying to a benefic (Venus) would suggest a no to the question regarding death in May. Perhaps Mars changing to a lesser dignity could show the radical 8th weakening in influence but it is also her dispositor. A retrograde Jupiter would describe an ill individual, as a retrograde planet often shows illness. Saturn retro is also in her first house in the chart here and Mercury would be her turned 12th ruler. Again, Mercury here to me seems to indicate the subject of her death/illness and not her significator. In my experience, death is often shown via the radical 8th and doesn't require turning the chart because it will be emphasized, as it is here. Since Mars is connected with her death here (and she has natal Mars opp ascendant ruler) and you mention her having Capricorn rising, when it retrogrades back into Capricorn, I might worry she could take a bad turn and she should be more careful during that time (and keep a good watch on her). At 91, that means she is in an 8th house profection year. Her natal 8th ruler is the Sun with loose opposition out of sign to Uranus, which would make sense that she would be dealing with heart issues this year. Hopefully she will make it through Sept/Oct for a profection change to the 9th house year. My guess is the time leading up to that will be difficult and she may not make it - I hope I am wrong, though. Thank you so much for your reading. I (we) do really appreciate your concern and warning about her health and safety. She is a very independent person and it is rather hard for anybody to keep a good watch on her. The fact is the reason she fell on the street and ended up in an emergency room was really her own self undoing. At this point, we are not surprised if anything happens to her any minute, though her head as well as her legs are getting much stronger since her stroke last year (which occurred within hours after her severe fall). She will be 92 in September and I would be very much surprised if she lives longer (all her children including my partner think she will live longer). Regarding her ascendant as Mercury: these horary questions came from both of us, and that is why I took 10th. Also she is very much into words, writing, reading, and she loves to tell her made up "stories" to us. So to me Mercury isn't so odd for her, but yes she is not young and I do fully comprehend about the description of people (as you've taught me about Breed and Leno -- that was funny! ).